FORT MORGAN — Defense wins championships. Or, for the Erie girls basketball team, a road game at Fort Morgan. The Tigers (10-6, 5-4) held the Mustangs (5-11, 1-8) to under 10 points per quarter in their 46-36 win. Erie gradually pushed the lead to 10 points in the second quarter, and held it there for the rest of the game. The Tigers, who had a cold night from deep (0-9 on three pointers), relied on their forwards (Anna Hefner and Alyssa Barnett) to hit shots in the paint (4 each) to keep their offense going. When Erie’s offense wasn’t going, the defense held the lead. The Tigers stole the ball from Fort Morgan 13 times, led by number 4 from Sami Erbe, and 3 apiece from Grace Moyers and Edie Morrow. Morrow, who has shown much improvement since the start of the year on the defensive side, also had 2 blocks for Erie. 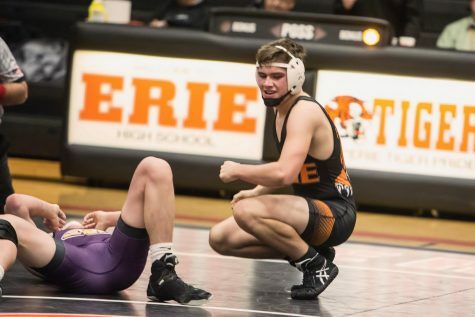 Erie will head to Roosevelt on Tuesday night as they look to continue their winning ways. As for the Mustangs, they will host Tri-Valley league leading Holy Family on Tuesday. In the boys game, a scoreless third quarter pushed the Tigers (6-10, 2-7) to their seventh straight loss despite controlling most of the first half. The seven losses in a row have all come in league play since starting 6-3. Erie will try to get a win when they head to Roosevelt on Tuesday night. Roosevelt is one of their two league wins. Ethyn Tyson led Erie with 17 points, and Kevin Loy contributed with 12. Hefner- 4, 3-4, 11; Barnett- 4, 0-0, 8; Patterson- 1, 4-4, 6; Kia- 3, 0-0, 6; Erbe- 2, 1-1, 5; Moyers- 1, 2-4, 4; Altshuler- 2, 0-1, 4; Morrow- 1, 0-0, 2. Tyson- 5, 4-4, 17; Loy 4, 5-6, 12; C. Rademacher- 2, 0-0, 5; Alexander 1, 0-0, 3; T. Rademacher 1, 1-2, 3; Lucero 1, 0-0, 2; Hargrave 1, 0-0, 2. Fouls (Boys) – Erie 24, Technical Fouls- Bench, Fouled Out- Nguyen; Fort Morgan 19, Technical Fouls- None, Fouled Out- None.